Chaos broke out in Professor Dolan's mansion. Everyone began talking loudly, a few female Neopets screamed, and several Neopets ran for the door. "What was that?" Gil asked me loudly above the noise. "It looks like the Crystal Anubis must have had some powers the Professor didn't know about..."
"No..." I muttered, rubbing my chin. "Someone was muttering... There is, or perhaps, was, a thief in our midst." "And a kidnapper," added Gil, looking around nervously like Marcus Oakley had done. "A kidnapper indeed..." I concurred. The chaos hadn't ended... No one seemed to be taking any charge. 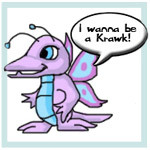 I saw some Neopets opening windows and jumping through them, because the door couldn't fit as many people as were trying to escape. "Quiet!" I yelled, sharply. It got only some people's attention at first, but after a few moments the room fell still. "Thank you," I sighed. "It appears that the Crystal Anubis has been stolen, and Professor Dolan kidnapped –"
"Are you sure?" yelled Shelly Rose from the back. "It was probably the Anubis, using some – some freaky power Dolan didn't know about." There was a murmur of agreement. "Thank you for that input," I answered over the murmurs, rolling my eyes. "In any case, I'd say this party is now over. If you'd all leave the mansion – in a civilized manner, please – so I can investigate?" Slowly but surely the room cleared. Only myself, Gil, Rufus Kipling, Felicia Westbrook, and the Moehog butler remained. Rufus's grin was gone, and his eyes were fiery. Felicia looked as though she could break into tears at any moment. "You think someone kidnapped him?" she asked shakily. "Positive. Those flashes came somewhere in the crowd, not the Anubis." I also explained the muttering I had heard. "So... they must have been doing some sort of..." mumbled Gil. "It wassss magic," hissed Rufus. "Probably ssssome ssssort of ancient sssspell, mosssst likely created by ancient Desert peoplessss." "My thoughts exactly," I agreed. "But who would know that k-kind of – of magic?" stuttered Felicia, eying Rufus suspiciously. "Miss Westbrook, the question isn't 'who,' but 'why'." I smiled softly. "As a detective, I find that starting with 'why' narrows the list of suspects down significantly more than wondering who could have done it." She nodded. "Well it'ssss obvioussss why they did it," snapped Rufus. "They wanted to ssssell it... The Crysssstal Anubissss is worth a fortune!" Gil piped in. "But everyone will be looking for it now, won't they?" There was a pause. "I mean, if they tried to sell it, the Anubis would be recognized, wouldn't it?" I chuckled. "Good point. However, not all collectors show off their valuables as much as Professor Dolan does. They just enjoy collecting, and I doubt they would mind breaking the law to get their hands on something so unique. But I doubt they were looking to sell anyway; there’s the kidnapping to consider." Gil looked at his feet. "So do you have any ideas, Sullivan?" Felicia asked me eagerly. "One..." I replied thoughtfully. "If I'm right, we should find out soon enough. All we can do now is wait, I believe." I looked Rufus straight in the eye. He looked confused. "I'm going to have a look around now, if you don't mind," I said. "And I'm going to ssssleep," hissed Rufus. He slithered up the stairs. “I’m guessing you don’t want me to...” began the butler. He looked like he might have trouble sleeping knowing the room was dirty (which it was; there were along the side walls with half-eaten food and glasses of punch all along them). His eyebrows were narrowed and he was blinking furiously as he walked out of the room. "Oh, I'm so worried..." Felicia said softly. I heard her footsteps pacing the floor. "It'll be alright," consoled Gil. "But what if the kidnapper takes me too?" Felicia yelled back. "After all I was on the expedition too... maybe the kidnapper wants information..."
"Don't worry, Sullivan'll catch... whoever it is. He's an amazing detective, he probably already knows who it is." I stuck my head in the back of the podium, half looking for clues. "And... I'll protect you." I bumped my head loudly and painfully on the top of the podium, and decided I shouldn't listen in anymore. I started seriously searching. Examining the top of the podium again, I noticed something I hadn't before... the wood was glowing faintly in two spots... they were shaped like hands. That must be where the Professor's hands were when he disappeared! I thought. I strode quickly around the table and towards the door. “Are you leaving?” asked Gil, watching me. “No,” I answered curtly. “Retracing.”	I thought for a moment, and started to walk slowly across the room, twisting and turning as I went, stopping every few feet. My eyes were on the floor. I walked for nearly a minute, when I saw it. Two oddly shaped footprints, glowing faintly like the hands had. “Come and have a look at this,” I called to Gil and Felicia. They walked over. Gil crouched down and, seeing the spot, felt it. “So why are there marks over here?” asked Felicia, frowning. “I expect these are the footprints of our culprit,” I explained. “He must have poofed himself away after he made the Professor and the Anubis disappear!” Gil realized. “Exactly,” I muttered. There was a long silence, each person lost in their own thoughts. “What do you think?” asked Felicia suddenly, frowning. “The fact that the footprints are on this spot,” I said, “just adds to my current theory. However, I could easily be entirely wrong.” Gil smirked as though he doubted it. “We’ll meet here tomorrow morning at nine o’clock,” said Felicia, promptly. “Are you sure you want to come? It’ll probably be boring; I don’t say much while I work,” I said, eyebrows raised. Felicia laughed loudly. I met Gil’s eye with a small smile, and he shrugged, grinning broadly. The walk back to our Neohome that night seemed very long. The night didn’t seem so friendly and peaceful anymore, but fickle and mysterious. Gil talked about Felicia for a few minutes. He started voicing his worries of someone kidnapping her. “I don’t think anyone would dare try... Not with you protecting her and all,” I chuckled. He blushed furiously and fell silent. We didn’t say much the rest of the walk. Russell bounded up at Gil and me when we walked in. I patted his head and said, “You up for some mystery solving tomorrow, Russell?” He seemed to understand, and barked loudly. I scratched him behind his ears. I awoke early the next morning to find Gil already awake, sitting at the kitchen table reading his book, “Draik Tales”. I glanced at the clock; it was 6:30. Gil was an early riser. “Morning,” he said, not looking up from his book. Russell was asleep on the armchair in the sitting room. “Did you dream up any more ideas last night?” asked Gil. Gil looked up at me with an eyebrow raised. “Not going to ask,” he muttered. Gil, Russell and I left at 8:30, after a small breakfast. The sky was gray and overcast, and there was a strong, chilly breeze. “Nice day,” said Gil. When I knocked on the brass knocker, Felicia opened the door nearly at once. There was a pause, as though she wanted us to guess. “Who?” I asked. “Rufus!” Felicia whispered wide-eyed. “It all fits! He was even a thief before Professor Dolan met him. He probably stole it because he wanted to put it back where it belonged to preserve the history or something. And I’ll bet he knows loads of ancient magic,” she said quickly. Felicia’s smile fell. She had probably been expecting a different response. “Well who else could it be?” she wondered aloud. “In a minute,” I muttered. I walked over to the podium and noticed that the glowing handprints had disappeared. They must wear off with time, I thought. He led us up the curving marble staircase. It led to a long hallway on the second floor. We walked past three doors, and the butler knocked on the fourth door to the right. We waited a minute. There was no response. He knocked again, but to no avail. I opened the door. The lights in Rufus’s room were off, his bed sheets wrinkly upon his bed, but no one was in the bed. I took out my magnifying glass and examined the bed. “Just as I thought...” I muttered with a triumphant smile. Russell barked, his tail wagging, and sniffed the bed madly. “His bed is glowing, just like the podium and table last night. And it’s fresh,” I added. “He’s disappeared!” yelled Gil, running over, Felicia behind him. They gaped at the bed. “But...” I began softly. I turned around, and immediately saw what I was looking for. There on the floor in the corner of the bedroom were the same glowing, oddly shaped footprints that had been on the floor the night before. Perhaps it runs in the family. Where Have All The Mutants Gone? A good question indeed! Where are the mutants among the ranks of our esteemed athletes? Surely one would expect to see several, at least among the ranks of the Virtupets and Haunted Woods teams.